E-readers are seldom exciting. They don’t take big leaps forward, but are typically updated and improved on in baby steps. Occasionally, something like the Kobo Aura One comes along, offering enough tweaks and smart upgrades to make a few waves. It has enough compelling features to be a serious contender in a market that’s been dominated by Amazon for years. The Kobo Aura One is big e-reader, measuring 7.7 x 5.5 x 0.3 inches. But weighing in at just 8.1 ounces, it doesn’t feel unwieldy or uncomfortable to hold during a marathon reading session. A texturized backplate helps you grip the device, but the material used for this purpose feels a little less premium than it should considering its $230 price tag. A slab of mildly frosted glass covering the E Ink display and its bezel restores most of the premium feel. 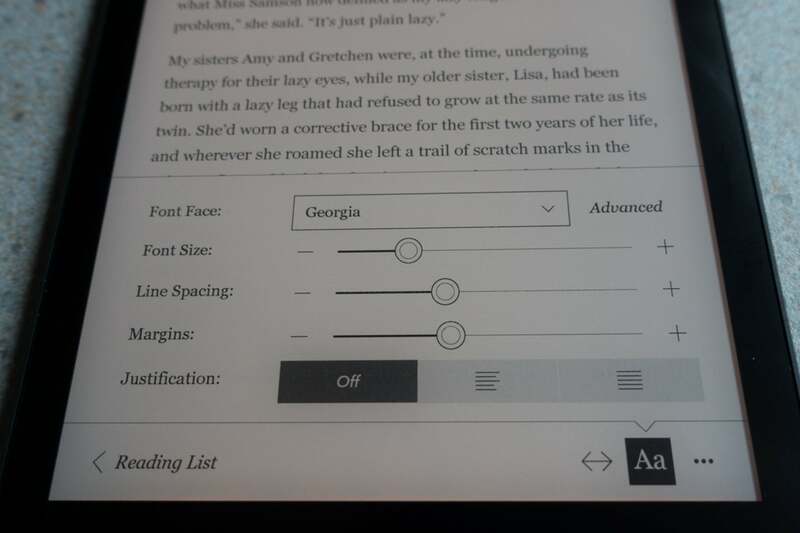 You can tap either the display or touch-sensitive areas of the bezel to turn pages or purchase and download books and magazines from the Kobo store. I found both regions to be highly responsive. The only physical button is located on the tablet’s backside and is used to power the device on and off. This e-reader’s 7.8 inch display (measured diagonally) is one of the largest a mainstream, consumer-oriented manufacturer has offered in recent memory. Text and images are displayed with 300 ppi resolution, the same as Amazon’s Kindle Paperwhite, Kindle Voyage, and Kindle Oasis. Readability is further aided by the inclusion of 11 built-in fonts, 50 font styles, and the ability to noodle with font weight and sharpness. 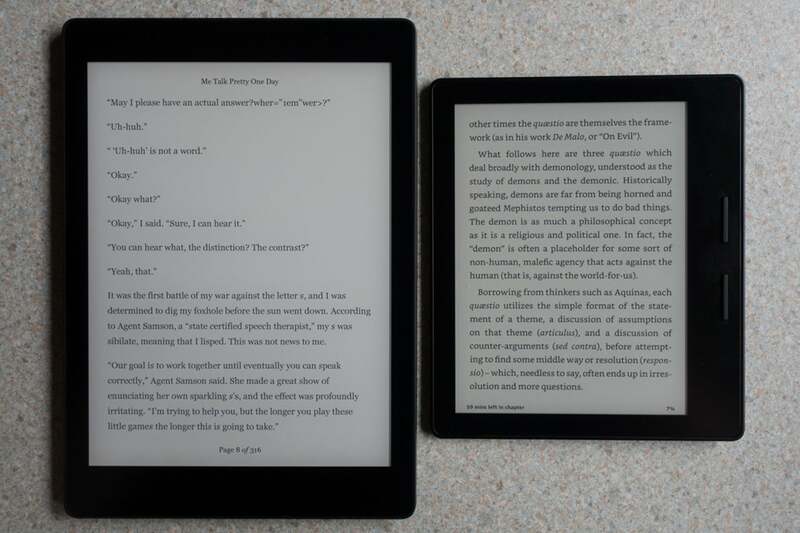 Compared to Amazon’s Kindle Oasis (right), Kobo’s Aura One is absolutely gigantic. After using the Kobo Aura One direct sunlight or in well-lit rooms for two weeks, I can say it offers a more pleasing reading experience than any of Amazon’s top three readers do. Using the Aura One in poor lighting conditions, on the other hand, has been more of a mixed bag. The manufacturer makes a big deal out of the Kobo Aura One’s ComfortLight Pro technology, which turns its daytime white spectrum backlighting to a warmer, circadian rhythm-friendly orange hue after dark, similar to what iOS users get with Night Shift on their iPhones or iPads. It’s a great idea, but I found that once the backlighting switched to orange, the display’s illumination became dim in the corners and inconsistent. It’s wasn’t unreadable, but it was mildly distracting. But Rakuten gets so much right with the Kobo Aura One that it’s easy to forgive such a minor shortcoming. For starters, it carries an IPX8 rating, which means it’s even more water resistant than the Kobo Aura H2O. (listen closely, and you can hear the sound of bathtub readers and klutzes across the land crying out for joy). It can survive being submerged in up to 6.5 feet of water for an hour. This feature alone may be enough for many people to consider buying the Aura One over one of Amazon’s devices. 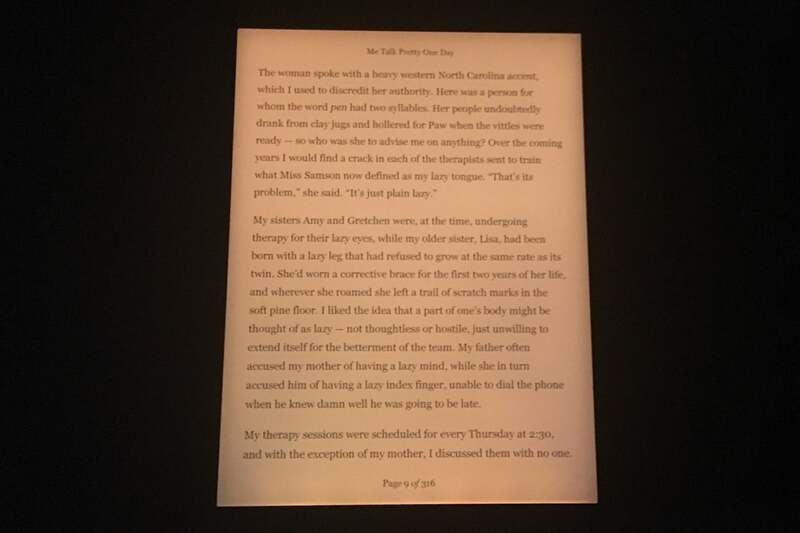 The Kobo Aura One’s hazy orange backlighting might make sleeping easier, but it can also make reading harder. If that’s not enough to tip the scales in Kobo’s favor, the Kobo Aura One comes with 8GB of storage—twice as much as any of Amazon’s latest e-readers. And with the number of file formats the Kobo Aura One can support—CBR, CBZ, EPUB, EPUB3, HTML, MOBI, PDF, RTF, and TXT document files, and BMP, GIF, JPEG, PNG, and TIFF images files—you’ll be glad to have so much capacity. Rakuten’s Kobo online store isn’t as substantial as Amazon’s Kindle Store, but it has improved by leaps and bounds over the last few years. You might have difficulties tracking down obscure titles in Kobo’s store, but popular reads and perennial favorites abound. Side loading your own personal files onto the reader is as easy as plugging it into your computer with a micro-USB cable. You can also borrow ebooks from your local library via OverDrive and your library card number or Facebook credentials. When your OverDrive loan period ends, the ebook simply disappears from your device. It's easy to customize your reading experience with the Kobo Aura One. Aside from the blurry appearance of the Kobo Aura One’s ComfortLight Pro, and the absence of the microSD card reader you’ll find on several other Kobo models (all of which have half as much memory), we can’t find a whole lot to criticize this e-reader for. No one would complain about getting a bigger battery, but that would have rendered it thicker and heavier. 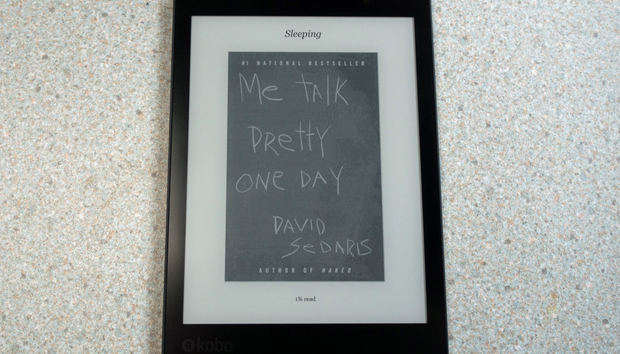 As it stands, this is strong e-reader and a worthy alternative to Amazon’s best.